It’s OFFICIAL! No second guessing and imagining what KRANG will look like. 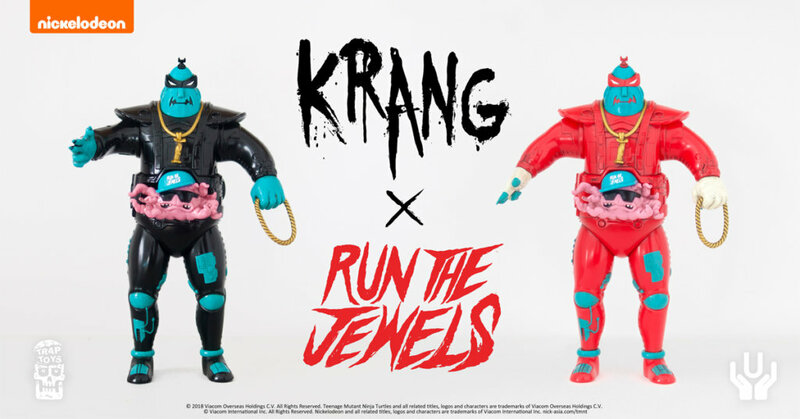 It was only last week we got into a frenzy and judging from the feedback you guys wanted to know more about RTJ KRANG from Trap Toys x Run The Jewels x Nickelodeon x Unbox Industries. Like we previously said last week, 2014 was arguably the rise of bootleg masters, Trap Toys with their RUN THE JEWELS x TMNT mashup. Cementing their name in the bootleg art toy world with one of their first releases. Over the past few years, it’s been a joy to watch what they’ve been coming out with and having a first and in looking at them in person. Fast forward to the present day and it looks like Trap Toys are working with Unbox Industries to bring you an all-new version of KRANG! RUN THE JEWELS x TMNT in a VINYL version baby. An official collaboration between Run The Jewels and Nickelodeon, the RTJ KRANG figure was designed by hip hop toy designers Trap Toys and produced by Unbox Industries. These limited edition figures stand at a massive 12″ tall and feature 8 points of articulation. This mashup sees Killer Mike as the formidable ‘Android Body’ from the longstanding Teenage Mutant Ninja Turtles series and EL-P as the evil mastermind brain with some added NY steez. All the while throwing up the iconic salute that is synonymous with the rap duo. This is a must have for any RTJ fan or TMNT collector alike. Made from soft vinyl with 8 points of articulation. 12 inches tall. Comes boxed. Krang 1: (Black & Teal) – Edition of 350 figures total. Krang 2: (Red & Teal) – Edition of 350 figures total. PRICE: Both colorways will cost $125 (usd) each plus p&p. Designed by Trap Toys and manufactured by Unbox Industries. Check out Trap Toys at ToyCon UK 2017 the Facebook LIVE Stream below check all the bootleg goodness!